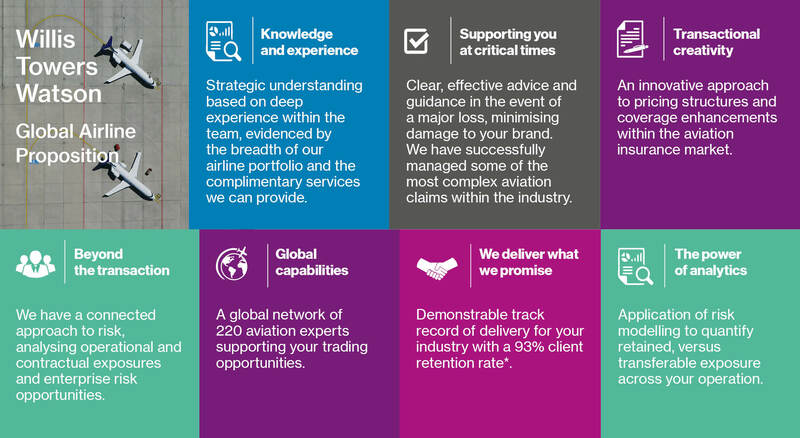 Willis Towers Watson is recognised as a world-leading global specialist insurance broker and a trusted risk adviser to the world’s airline industry, providing innovative solutions for more than 300 airline clients around the world. Working alongside our local partners with aviation specialists based permanently across 45 locations in 28 countries, we have developed a range of unique solutions that compliment our traditional aviation insurance broking services. We pride our self on looking beyond the scope of the insurance transaction to contemplate and address a much broader spectrum of risk that airlines typically face in their day-to-day operations. CyFly won “Broker Innovation of the Year” at the European Risk Management Awards 2017 and was shortlisted for “Cyber Innovation (broking)” award at the Insider Cyber Awards 2017.